In our last week, we turn to thinking about the prospects for creating a utopia. Is a world free of war, violence, and scarcity possible? We consider the actual state of extreme poverty relative to the United Nations Sustainable Development Goals. We consider whether it is possible or likely that humanity can leave in a state of peace in which state violence and interpersonal violence is a thing of the past. And lastly, we consider an article advocating for a universal basic income as a way of reclaiming the future in which people live a life of comfort while only work 15 hours a week that was predicted over a hundred years ago. Lastly, we consider a short excerpt from Derek Parfit’s book Reasons and Persons where he suggests that human history may just be beginning and the role that moral philosophy may play in the future of humanity. Kant’s essay Perpetual Peace examines what it might take to bring about a world in which war is a thing of the past. Kant’s insistence upon republican governments throughout the world may be an expression of his idealism, but his insistence upon a federation of such governments rather than a single world-government is a sign of his realism: he thinks a single world-government would just be too big to govern by republican means and would inevitably degenerate into a tyranny. He argues that we may think of differences of language and religion as providential provisions of nature to make a single-world government impossible, while the spread of trade and its need for respect for rights of property and exchange across national borders should inevitably encourage internationalism. The path to achieving perpetual peace is analogous to how we go from a state of nature to a social contract. Right now we are in a state of nature regarding international relations because there is no international social contract. The republican constitution . . . offers a prospect of attaining the desired result, i.e. a perpetual peace, and the reason for this is as follows. —If, as is inevitably the case under this constitution, the consent of the citizens is required to decide whether or not war is to be declared, it is very natural that they will have great hesitation in embarking on so dangerous an enterprise. For this would mean calling down on themselves all the miseries of war, such as doing the fighting themselves, supplying the costs of the war from their own resources, painfully making good the ensuing devastation, and, as the crowning evil, having to take upon themselves a burden of debt which will embitter peace itself and which can never be paid off on account of the constant threat of new wars. But under a constitution where the subject is not a citizen, and which is therefore not republican, it is the simplest thing in the world to go to war. For the head of state is not a fellow citizen, but the owner of the state, and a war will not force him to make the slightest sacrifice so far as his banquets, hunts, pleasure palaces and court festivals are concerned. He can thus decide on war, without any significant reason, as a kind of amusement, and unconcernedly leave it to the diplomatic corps (who are always ready for such purposes) to justify the war for the sake of propriety. Democracy is a kind of despotic form of government because one single entity has all the power. IN a republican system of government there is a separation of legislative, judicial, and executive powers. What this chart shows is that at the start of the industrial revolution almost everyone in the world lived in extreme poverty. At the start of the 1900s that number was over 80%, but over the past 100 or so years that number is now down all the way below 10%. The decline has been particulary rapid in the past 30 or so years going from around 35% to just under 10% in 2015, which is absolutely staggering. This chart shows whose income has increased and by what percentage from 1988-2008. What you can see is that most people’s income has actually gone up in this period. Although the bottom 10% of the world’s population didn’t really see their income go up and the people in the top 80-90% didn’t really see their income go up. Those people in the top 80-90% are the “middle class” in the US and Europe. In this period their income did not increase. So while income is going up for most people around the world, the MIddle class in the developed world hasn’t gone up. The United Nations has set a goal as part of their Sustainable Development Goals to eradicate extreme poverty by 2030. It is hard to overstate how amazing that is. 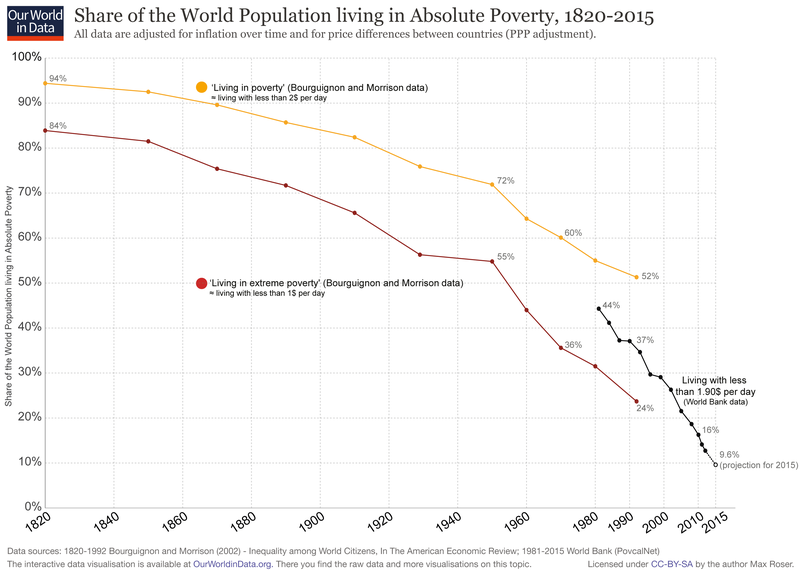 Within a few short years extreme poverty may literally be a thing of the past. Thus far it looks like we may only get down to about 5% by 2030, but even if that is true, extreme poverty will almost certainly be eliminated sometime shortly after 2030. That being said, eliminating extreme poverty is not the same as eliminating poverty. Poverty rates in the US are extremely high yet very few of those poeple are living in extreme poverty as defined by less than 1 or 2 dollars a day. Now let’s consider what it would take to completely eliminate poverty, not just extreme poverty. In 1930 the economist John Maynard Keynes wrote an essay titled Economic Possibilities for our Grandchildren. The 19th century saw an increase in production, an increase in work, estimated at 60 hrs per week, but mass poverty. Most economists in the 19th century agreed with Malthus, except Marx. By the late 19th century Malthus was being proven wrong. People were having smaller families and the middle class was growing. But they didn’t have an economic theory to support their ideas. Throughout the middle of the 20th century it seemed that Keynes was right. The rise of the social democratic welfare state had begun to make extreme poverty and destitution a distant memory for most. People expected to retire at 65. Etc. Most people felt they could change their job if they found it too unsatisfactory . “The central theoretical tenet of market liberalism is the efficient (financial) markets hypothesis. In the strong form that is most relevant to policy decisions, the hypothesis states that the prices determined in markets for financial assets such as shares, bonds and their various derivatives are the best possible estimates of the value of those assets. In the core ideology of market liberalism, the efficient markets hypothesis is combined with the claim that the best way to achieve prosperity for all is to let the rich get richer. This claim is rarely spelt out explicitly by its advocates, so it is best known by its derisive label, the ‘trickle down’ hypothesis. He didn’t consider housework and children. The first step would be to go back to the social democratic agenda associated with postwar Keynesianism. Although that agenda has largely been on hold during the decades of market-liberal dominance, the key institutions of the welfare state have remained both popular and resilient, as shown by the wave of popular resistance to cuts imposed in the name of austerity. Key elements of the social democratic agenda include a guaranteed minimum income, more generous parental leave, and expanded provision of health, education and other social services. The gradual implementation of this agenda would not bring us to the utopia envisaged by Keynes — among other things, those services would require the labour of teachers, doctors, nurses, and other workers. But it would produce a society in which even those who did not work, whether by choice or incapacity, could enjoy a decent, if modest, lifestyle, and where the benefits of technological progress were devoted to improving the quality of life rather than providing more material goods and services. A society with these priorities would allocate most investment according to judgments of social need rather than market signals of price and profit. That in turn would reduce the need for a large and highly rewarded financial sector, even in relation to private investment. There remains the question of how to move from a revitalised social democracy to the kind of utopia envisaged by Keynes. It would be absurd to spell out a detailed transitional program, but it’s useful to think about one of the central elements of such a society — a guaranteed minimum income. In one sense, a guaranteed minimum income involves little more than a re-labelling of the existing benefits provided by all modern welfare states (with the US, as always, a notable exception). In most modern welfare states, everyone is eligible for income support which should be sufficient to prevent them from falling into poverty. Those who cannot work because of age or disability are automatically entitled to such support, while unemployed workers receive either insurance benefits related to their previous wages or some basic allowance conditional on job search. In a post-scarcity society, everyone would be guaranteed an income that yielded a standard of living significantly better than poverty, and this guarantee would be unconditional. The move from a near-poverty benefit subject to eligibility conditions to a liveable, guaranteed minimum income would require both an increase in productivity, such that a smaller number of workers could produce an adequate income for all, and some fairly radical changes in social attitudes. This brings us to the final, really big question. Supposing a Keynesian utopia is feasible, will we want it? Or will we prefer to keep chasing after money to buy more and better things? An escape from what Keynes called ‘the tunnel of economic necessity’ is still open to us. Yet it will require radical changes in the economic structures that drive the chase for money and in the attitudes shaped by a culture of consumption. After decades of finance-driven capitalism, it takes an effort to recall that such changes ever seemed possible. . . Popular anger has boiled over in a string of electoral defeats for the advocates of austerity. But, unlike the right-wing tribalism that has formed part of that backlash, progressive politics cannot, in the end, rely on anger. It must offer the hope of a better life. That means reclaiming utopian visions such as that of Keynes. “In 1961, government amounted to something like $ 33 billion (federal, state, and local) on direct welfare payments and programs of all kinds: old age assistance, social security benefit payments, aid to dependent children, general assistance, farm price support programs, public housing, etc.1 I have excluded veterans’ benefits in making this calculation. I have also made no allowance for the direct and indirect costs of such measures as minimum-wage laws, tariffs, licensing provisions, and so on, or for the costs of public health activities, state and local expenditures on hospitals, mental institutions, and the like. Andrew Yang is a democratic candidate for president running in 2020 on the platform of providing a universal basic income of 1000 dollars to all US citizens. He believes that automation is changing our economy making a universal basic income necessary. Below is a video that is several years old showing how automation is going to change the economy creating massive unemployment. When we think about a future in which there is no violence we can’t separate the environment from questions about human nature. Pinker argued that the post-enlightenment environment allowed the “better angels of our nature” to predominate over our baser instincts. Contemporary research in the psychology of morality would support that assertion. Below is an interesting video showing how much more intelligent humans have become in the last 100 years ago. The average person 100 years ago would be considered to have a severe mental disability now, and a person of average intelligence in our current time would be considered gifted 100 years ago. In 100 years from now will everyone be a genious with an 1Q well over 130, by current standards? If so how would that change the world? It is reasonable to assume that would make the world a vastly different place. And that doesn’t even consider the possibility for radically changing human nature via gene editing. The above quite might seem unrealistic but consider this idea in the context of a world in which poverty is a thing of the past. Interestingly the division in run parallel to the divisions in social class. The poor of the world tend to be less educated and share a similar world view, that includes morality but extends into deeper questions about the universe and human nature, while the world’s more affluent populations share a world view oriented around the possibilities for creating a new world free from poverty and other forms of oppression. Right now division might seem like a natural fact of life but context shapes our psychology in profound ways. Think back to Jonathan Haidt’s moral foundations theory. In a future without poverty it is reasonable to assume people will share views on the fundamental nature of reality, human nature, and therefore a wide range of moral issues. I believe that as long as we don’t completely destroy human society via nuclear war, an outbreak of an incurable contagious disease, or climate change, a utopia is not only possible but seems likely given the progress we have made over the last 500 years or so.